Close protection staff, while they do not offer a sweeping eye on security as stewards or general security personnel may, are still considered a vital part of the puzzle. If your event is catering to particularly sensitive groups of people or additional security is required for your party, it’s important to understand that a simple core staff may not necessarily suffice – close protection is an absolute must. Close protection is essentially the step between having a security team monitoring your party and personal body guarding. Close protection does exactly what it says in the job description – think of it as a personal force field for one or more people who especially need it. While those specialising in close protection may not have all the requisite skills and allowances of a bodyguard, if you need to keep close quarters on a certain person or group of people in order to protect them from trouble, your best option is to hire close protection – as you can then therefore allow your other security personnel to keep a roaming eye on the rest of the party while your close protectors can ensure that your VIP guests are given the specialist care they need. Close supervision can be provided whatever the weather, whatever the cause, and wherever the event – and Aces Security Leeds can provide a wide array of talented and exceptional security experts who can help bring a close and dedicated service that you will expect from only the best for your money. 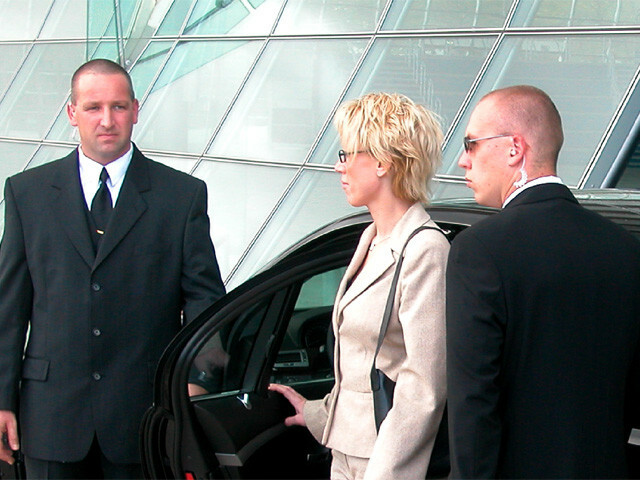 Whether you’re in need of close protection for a certain group of people or if there are one or two particular VIPs that require specialist attention, we will be able to provide you with a talented and enthusiastic security specialist who will make sure that your guests are given the additional hospitality that they deserve. We all know what bodyguards do – but what makes a truly excellent bodyguard? While security personnel all need a keen eye for certain behaviour and to know how to diffuse a situation to prevent problems from escalating, a bodyguard needs a little more specialist training – and willing – to be able to protect VIPs and people in particularly special need for singular protection. Whether it is a decorated war hero, a politician, a pop star or even a member of royalty – a bodyguard must always be on hard ensure that they are both safe and away from any situations liable to be dangerous. This will, of course, mean close protection, and to monitor a certain VIP at all times. Such close protection requires a certain type of person to carry out the role, and to really do it well – a good bodyguard is one who not only succeeds in protecting the life and interests of those they are instructed to shield, but is also physically skilled, unafraid of conflict, and may even need to be willing and able to put themselves in the line of danger at all costs. Such is the life and work of a bodyguard – protection at all costs! If you’re in need of a talented and tireless bodyguard to protect your VIPs, one that will be willing to offer constant close surveillance and protection from any potential dangers that may arise, look no further than Security Leeds – we represent a wide catalogue of confident security personnel and willing bodyguards who have been vetted for talent and experience – meaning that you will always be guaranteed of quality security from each and every member of staff you hire from us.